The environment for children 3 to 24 months room is conducted by caring and fully trained teachers who offer a comfortable and loving atmosphere to our babies. We established an environment that is clean, safe, nurturing, stimulating and soothing, with plenty of hugs, cuddles, talking and listening. It is our goal to have dedicated staff pay close attention to your child’s needs, and surround him/her with feeling of warmth and security. Parents are welcome to join their children for meals, including breast-feeding. Each day the children participate in activities that stimulate the developmental process. The materials in this room will be specially designed to equip the child in their learning process. The teachers provide one on one interaction throughout the day. Our goal is to enable the peer learning, that is an essential part of the development of the child’s ability to build social relationships. The children will spend time outdoors each day to enrich their development as well. It is a key component in our program for the child to experience the sights and sounds of the outdoor environment. The infant-toddlers are encouraged to listen to the sounds of nature and to participate in other stimulating sensorial activities while enjoying the outdoors. An important key element to this program is our partnership with parents. Communication between our teachers and you, the parent, is essential. Exercises of Practical Life - These are activities which satisfy the child’s tendency to imitate and develop coordination of movement, independence, self-confidence, body consciousness, self care and self awareness, the social skills of grace and courtesy, awareness of and care for the environment – indoors and out of doors – dealing with and solving of difficulties, concentration and attention, order and positive attitudes towards learning. Sensorial Materials – These are activities for the development and refinement of the senses. The materials isolate one single physical quality from the environment (e.g. dimension, color, shape, or texture). Focusing on the use of one sense at a time, enables the child to exercise and refine each sense to the utmost. This refinement is essential for the development of the mathematical mind (i.e. the ability to discriminate differences, similarities, and identities) and for the development of the memory, understanding and will – the faculties of the intelligence – the imagination, and consequently the appreciation and interpretation of language and fine arts. 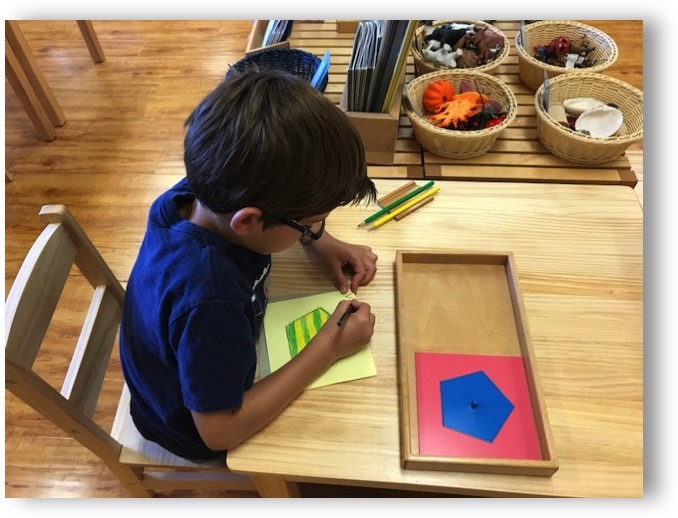 Mathematical Materials – these are activities by means of which the child does not learn mathematics, but discovers them, acquiring the necessary skills to calculate in the decimal system and in other basis by exploration, moving from concrete experience to abstraction. Language Materials – These are activities by means of which the child acquires, phonetically, the basic skills for complete writing and reading, and at a very early age, understanding the parts of speech, oral expression, creative writing and interpretative reading and appreciation of prose and poetry. The Language area includes also what we call “keys to the cultural subjects”, because once the child is versatile in the use of all the above skills; he possesses the necessary tools to explore the world of knowledge. Join this fun and play that form the foundation for our Spanish classes. Children will learn key phrases in their new language through simple, repeated songs and chants. 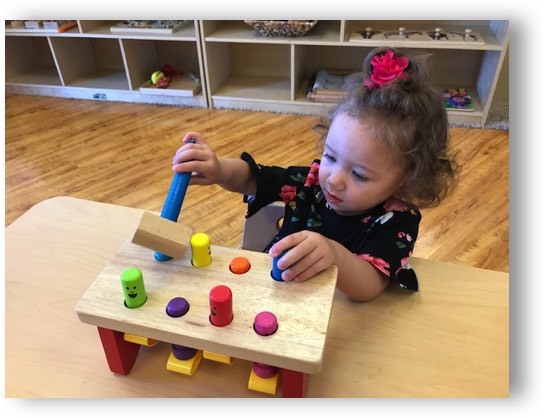 Meanwhile, they become familiar with more complex aspects of the language by engaging in "adventures," art projects and movement-based games that require them to solve simple problems - in their new language, of course! These adventures combined with our multicultural cast of characters, take students to other lands and cultures to ensure that their language instruction is combined with cultural exposure. Children at any age are growing rapidly. While we focus on teaching to write letters and sounds music and movement activities may be just as important to developing minds and bodies. Music is taught in a group setting with musical stories, instruments puppets and body movement. Fine Art is introduced through mixed sensory mediums such as clay, watercolor, acrylics, scissors and more. Children will learn through sensory exploration and create various finished art projects.